At the biggest and hottest World Cup ever (so far) in Antalya, Turkey, there was a lot at stake for many nations. 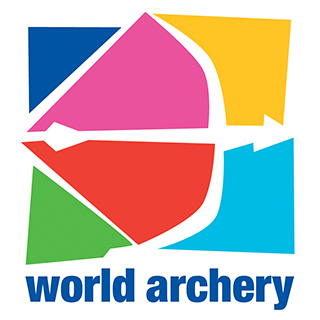 It was a week of joy for some and tears for many, announced retirements and a great display of archery by the Korean athletes. Here are some photos and facts to summon up the week. Being the longest number one seed in the history of the World Cups and probably with the longest winning streak Sara did it again. 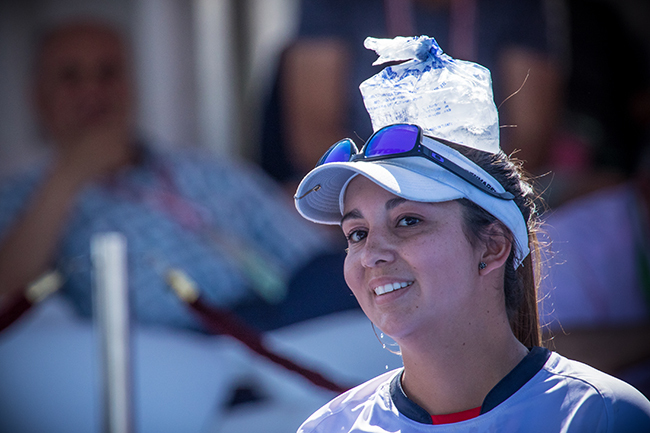 After winning three gold medals in the previous leg in Colombia, she left Antalya with another individual and mixed team gold to ad to her already immense collection. The only match she lost recently was the “battle of the sexes”, a match between her and world number one ranked Mike “Mr. perfect” Schloesser from the Netherlands. 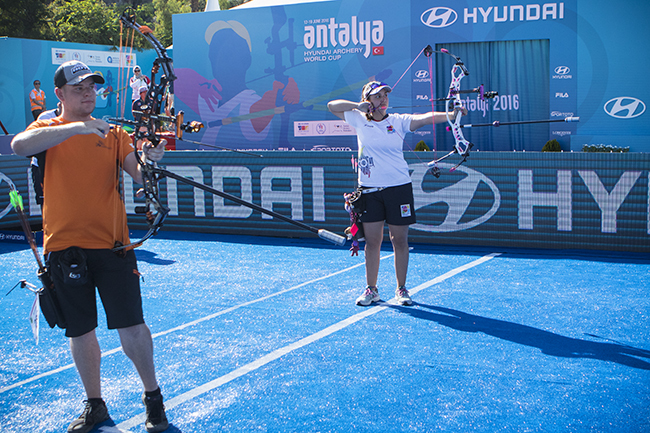 During this exhibition match Sara missed an arrow and gave Mike an easy cruise to victory for the men. Sara vowed revenge and needless to say we can not wait for the rematch! 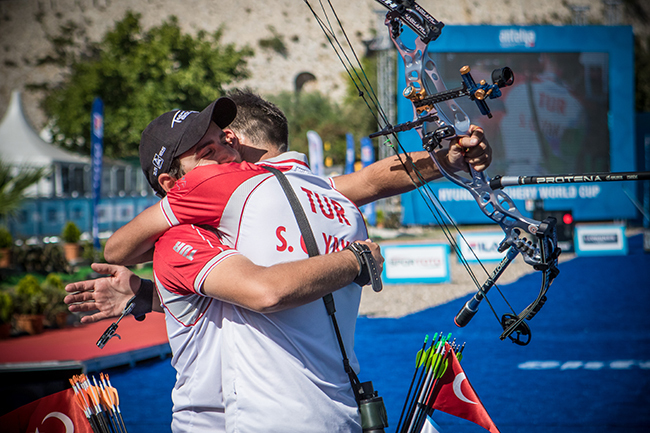 A gold medal for host nation Turkey was a sure thing as Evren Cagiran and Samet Can Yakali made it all the way to the final. Evren was the better of the two and Domagoj Buden completed the podium. 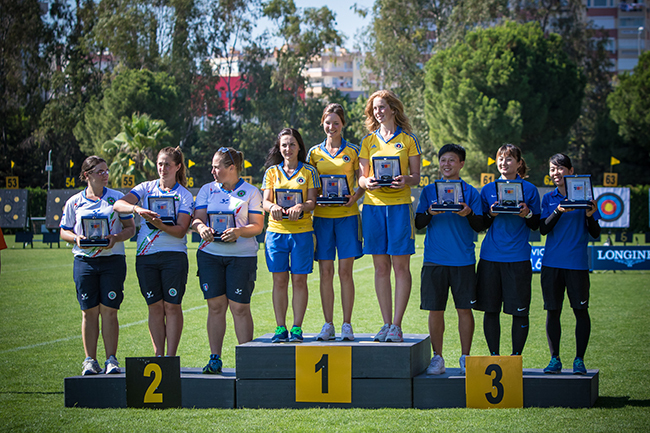 A third medal for the host was the bronze medal for Yesim Bostan and the gold went to none other then Sara Lopez and silver to Dahlia Crook from the USA. Team USA won the gold over Italy and the bronze went to Danish men. The ever strong Russian women disposed of the Dutch team and the surprising Indonesian women won bronze. 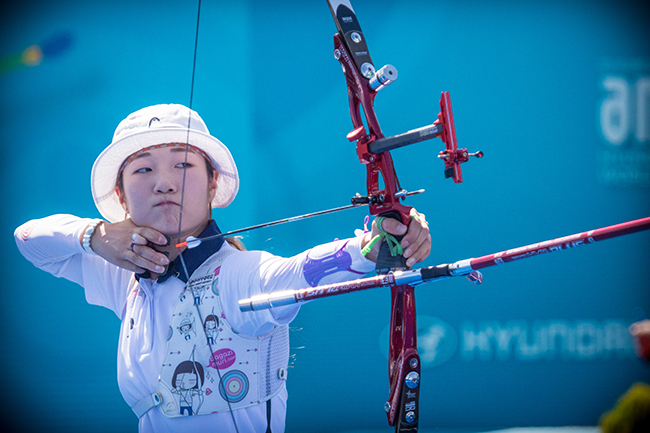 The Koreans showed good form on their road to Rio 2016 by winning all gold medals in the recurve competition. 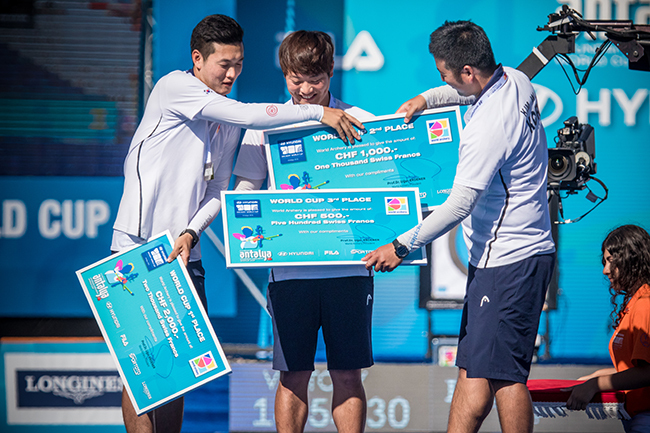 With Lee Seungyun, Ku Bonchan and Kim Woojin the Korean men swept the podium in the individual men. The same trio won the team rounds in the morning session. For the individual women the gold went to Choi Misun who also won gold with her team mates earlier in the day and another gold in the mixed team. The reigning world champions from Russia were left with a silver medal while the youngsters of team Italy won the bronze. 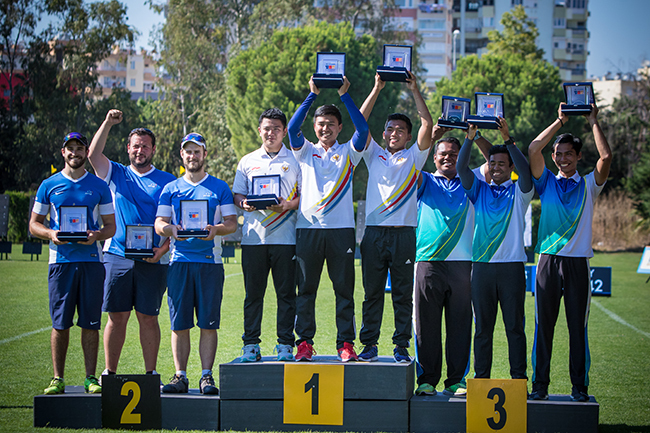 The Mexican men who just missed out on a team quota for Rio 2016 earlier in the week finished in second place behind Korea and team USA got the bronze medal. The Brazilian men’s team had a shot t a medal for the first time in the 10 year history of the World Cup. With temperatures above 30 Celcius and some days even just above 40 it was necessary to keep everything cool. Team doctors and physios were doing overtime to keep their athletes cool and hydrated.  With the disappointment of not getting the quota for Rio 2016 a few archers decided it was time to either definitely stop competing internationally or take some time of. 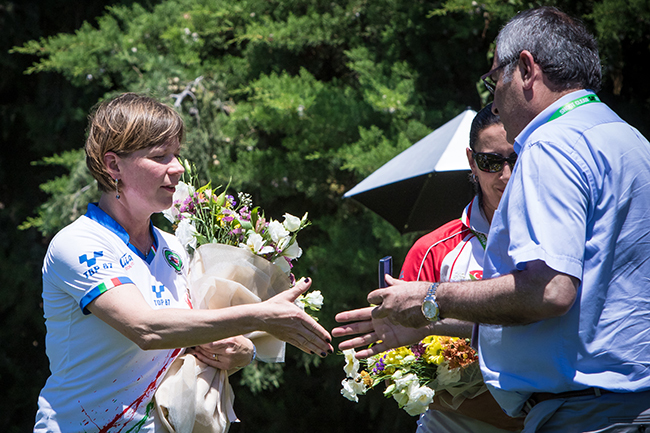 The great Natalia Valeeva (ITA) came to Antalya and was honored for her achievements through her career. If there was to be an archery hall of fame she should be one of the first to be inducted. Another big name who announced retirement was France’s Berengere Schuh. 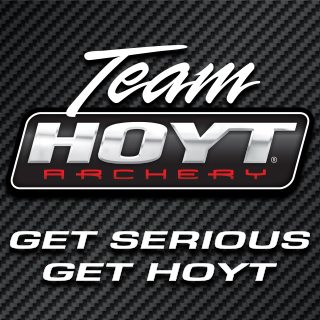 Indonesia, France and Malaysia for the men the start list for teams is now completed. Further more there are five men and six women added to the list of individuals.